Scott Kay Review - How do they compare with other designers? Promising to ‘Never Compromise’, Scott Kay stay fairly under the radar when it comes to expert reviews. A huge celebrity jeweller in the late eighties and nineties, they have continued to quietly coast in the world of bridal jewelry. A quick google search will bring about a confusing array of conflicting customer reviews surrounding this brand. With an evident push towards artistry across the company website, does Scott Kay’s diamond jewelry live up to their promise, or are all the rumours true? Founded in 1984, Scott Kay drove himself into the bridal jewelry industry creating artistic works in platinum. His life of poverty in Brooklyn was left behind when he started a new chapter in his life at the Fashion Institute of Technology, and his naturally creative streak can be seen throughout all of the company’s designs. The company work in an artisanal fashion, with just a handful of jewelry makers continuing Scott’s legacy of unusual rings that tell a story. 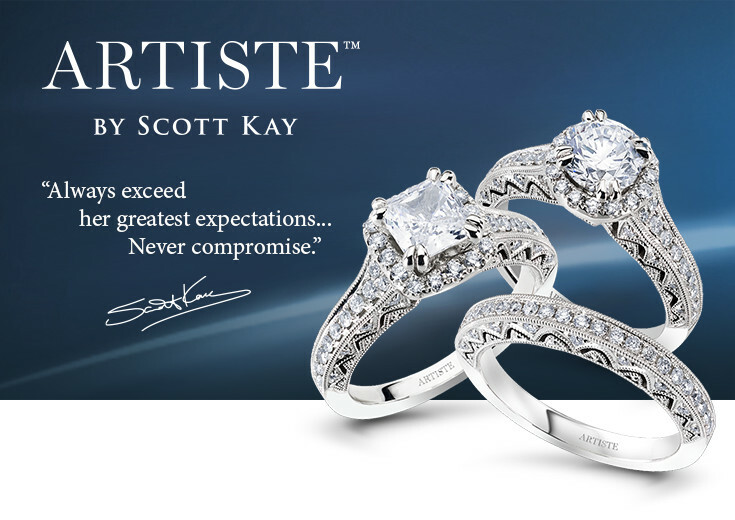 Scott Kay was credited with helping resurrect platinum in the united states with his designs and Conde Nast hail him as the man who created the first bridal jewelry advertising campaign. He continued a path of innovation until his death in 2014. Before his death, Kay had spoken out to the press saying he missed the hands-on aspect of creating and dreaming up jewelry and had planned to return to a more creative role within the company. His family stated that the company would continue to push forward with zest and passion and CEO David Minister assured the public that Kay had left behind a wealth of designs that were yet to released. There is no denying the ambition and creativity of Scott Kay designs. In an industry flooded with variations of the solitaire and polite designs with little to say, Scott Kay rings are bold and refreshing. From the Namaste collection, representing the love and respect between two spirits, to the Parisi collection, with overlapping arches representing a step in the journey of a relationship, there is thought, sentiment and imagination in each and every ring. His engagement rings usually have an accompanying wedding band to perfectly compliment the stand-out design. Aside from Namaste and Parisi, Scott Kay currently has five other distinctive collections: Heaven’s Gates, Luminiere, Embrace, Crown Setting and Guardian. Looking for a Scott Kay Retailer? Check out Jared, Helzberg Diamonds and Solomon Brothers. Sadly, the executions of these sensitive and complex designs leave a lot to be desired. In truth, even the biggest names in jewelry will suffer the occasional mishap; stones do come loose, bands can break and prongs can bend, but these mistakes seem to happen a great deal with it comes to Scott Kay designs. This leaves buyers in a tricky position. For a classic solitaire, the answer is simple; buy one elsewhere. However, with designs that are so unique, if you have your heart set on a particular Scott Kay ring you might find yourself searching for an alternative with little avail. Some designs also seem to be specifically geared towards fleeting trends within the jewelry world, leading to a somewhat confused portfolio of designs. A positive point regarding Scott Kay jewelry is they do offer a lifetime warranty, although I still suggest reading all the small print before considering a purchase. Scott Kay also offers men’s jewelry in precious and semi-precious metals and gemstones. Collections include Beads, Faith, Guardian, Equestrian, Samurai and Sparta. These collections appear to exemplify the creative spirit behind Scott Kay and are uninhibited by market trends and aesthetic expectations which is so often the case with bridal jewelry. If these designs with executed without flaw, Scott Kay might just be one of the most reasonably priced designers around. Their designs are often adorned with diamonds and complex metal work, with woven and lattice elements. Sadly, past experiences suggest that you pay for the creativity and not the craftsmanship. 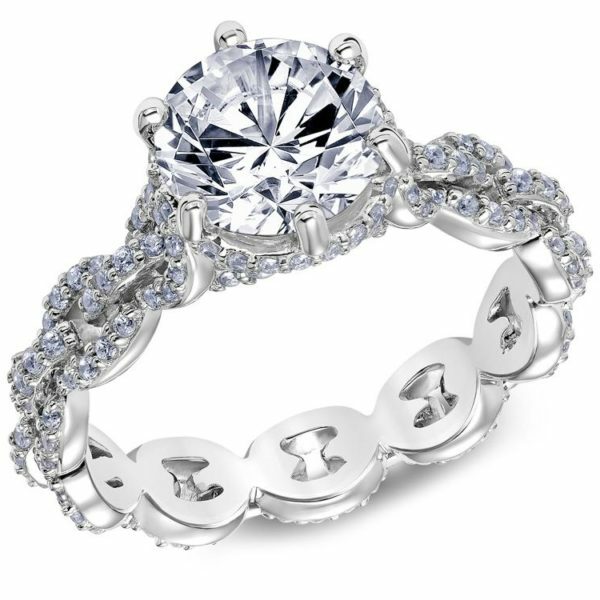 Pay for a Scott Kay ring but know that you may be spending more in the future having it fixed. I admired the brave, pioneering spirit of Scott Kay, and continue to admire the company for their attempts at continuing his artistry and legacy following his death. I do not feel that these designs are being completed to their full potential, making it difficult for me to recommend them. Without perfect execution, the whole brand seems gimmicky and tacky. Should Scott Kay tighten up on their craftsmanship and finish, they would be one of the most stand-out bridal brands around; until that time comes, your money is better spent elsewhere. Make sure you read my other Engagement Ring Designer Reviews, including Tacori, Jeff Cooper and A Jaffe.